Bánh khọt are lovely little things: crispy discs of rice flour batter and coconut milk (fried in individual molds until they’re crunchy on the outside but moist on the inside), coloured with turmeric, topped with shrimp or squid, sprinkled with shrimp powder and spring onions, then served – a half-dozen at a time – on a plate piled high with big green leaves (lettuce and mustard leaf) and fresh herbs (sweet basil, water mint, perilla, fish mint) for wrapping and rolling, and then dipped in sweet and spicy fish sauce, and devoured in one go. Looking like a collection of asymmetrical coins from a haul of ancient treasure, bánh khọt are mostly found on the southeast coast, but nowhere more so than the thriving beach town of Vũng Tàu. 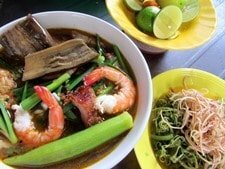 Here, bánh khọt eateries are as ubiquitous as 7-Eleven stores in Bangkok: you’re rarely more than a 5-minute walk from one. Every Vũng Tàu local, and every Vietnamese foodie, has their personal favourite, but there are loads to choose from and I’ve rarely been disappointed with any. On this page, I’ve put together a list of just seven of the many good places to try bánh khọt in Vũng Tàu. 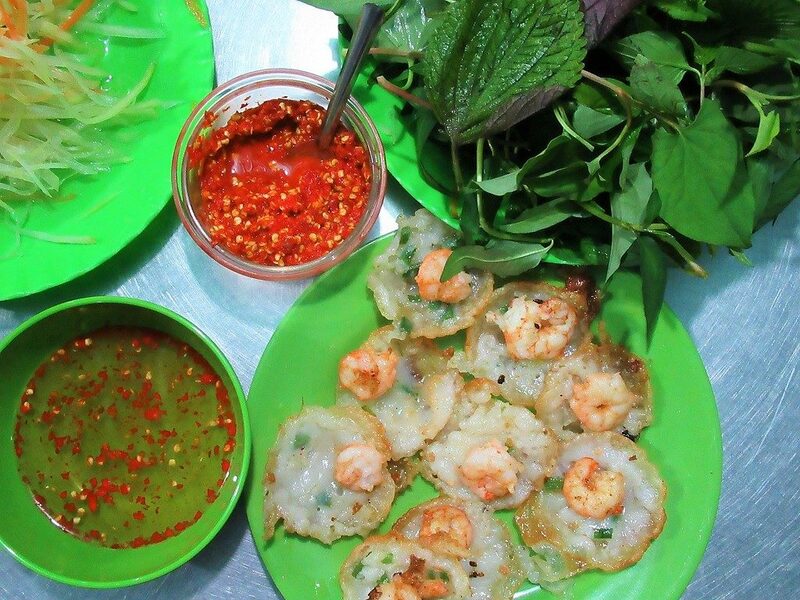 Bánh khọt is cheap, fun, finger food: it can be eaten at anytime of day; as a snack or a full meal; enjoyed alone or as a group. However, check the opening times of the places listed below, because not all of them are open all day. 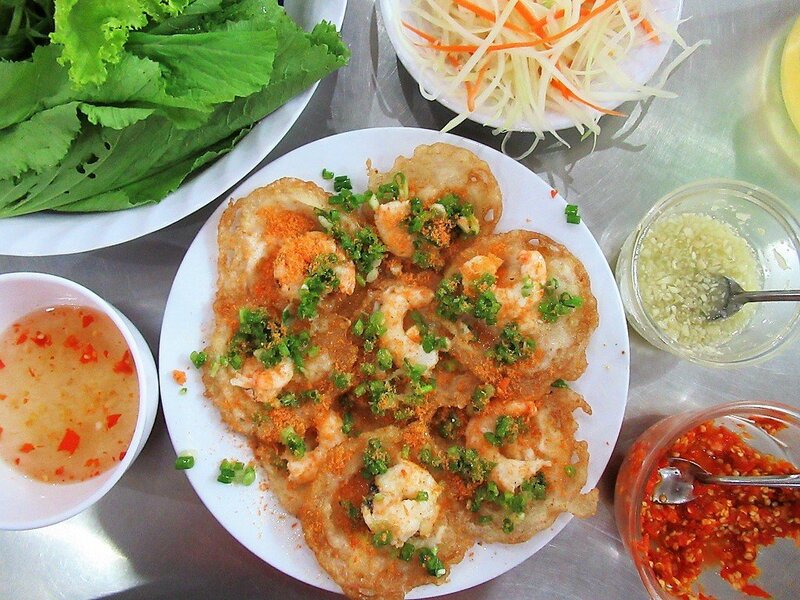 The following places to eat bánh khọt in Vũng Tàu are in no particular order: they are all good places to sample this dish, but none of them are perfect. This list is by no means exhaustive and I make no claim that these are the ‘best’ places to eat bánh khọt: keep an eye open for signs all over Vũng Tàu saying bánh khọt and you’ll surely discover many more. They tend to be in clusters in certain parts of town. 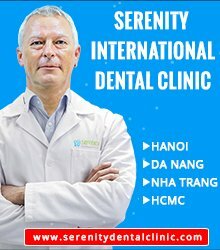 Most are informal, family-run operations, many of which have been in business for years. 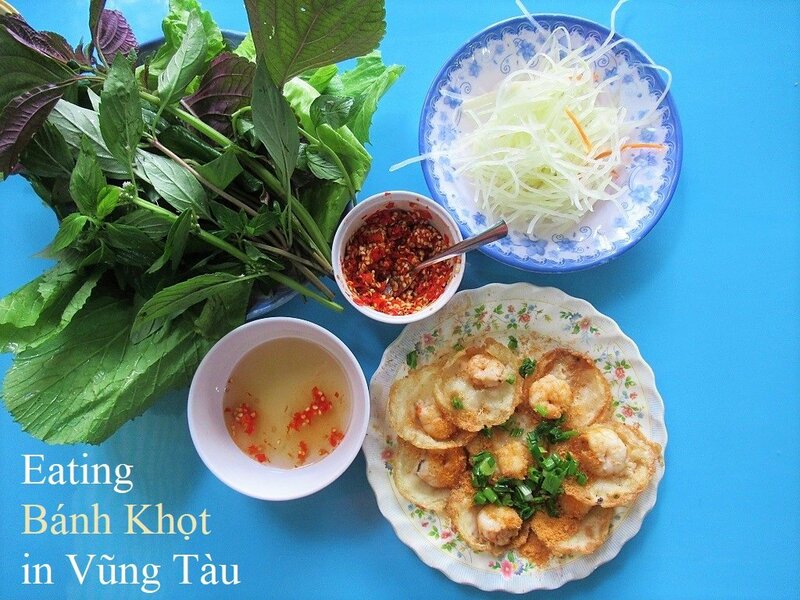 To eat bánh khọt as the locals do, pick up one of the fried discs and wrap it in a big leaf with the smaller herb leaves inside, add some pickled radish or green papaya, fold it into a parcel, and dip it in the sweet-spicy sauce. It’s hands-on, finger-licking, fun food. Enjoy! A golden oldie, Bánh Khọt Gốc Vú Sữa is named after the old, purple star-apple tree that grows beside it. This is a family-run, local place that has stood the test of time. The low tables and stools on the tiled floor are always packed, and the owners are fiercely proud of their product. Here, they use wood for their cooking fire: not gas or coal. This is the real deal, and, incidentally the first bánh khọt in Vũng Tàu that I ever had, (god knows when that was: probably 9 years ago now, but the experience has stayed with me). Today, this place is one of Vũng Tàu’s ‘famous’ go-to joints for bánh khọt. The little fried medallions are perhaps the least oily of all the ones in this list. The plate of greens is good and fresh, and there’s plenty of perilla (my favourite). The shrimp are large, and the overall flavour is lighter than others in this list. However, on the back of its fame, prices have gone up: these days, at 50,000vnd per dish, it’s one of the most expensive in the city. As soon as you arrive here you know you’re somewhere good. Bánh Khọt Cô Xuân is out of the way, but it’s well-worth the trip. 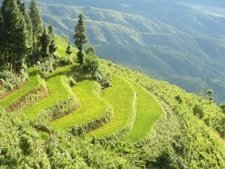 It doesn’t promise much from the outside (remember that good dining in Vietnam is rarely about appearances), but venture down the narrow corridor and you’ll find a hive of food-related activity. Locally famous (many Vũng Tàu residents will tell you that this is their favourite), Cô Xuân remains extremely informal: long rows of metallic tables and plastic stools line-up under a makeshift roof on a concrete floor, strewn with discarded tissues, sprigs of greenery and spillages of chilli sauce. The bánh khọt are cooked in full view of the customers; the whole place echoes to the sound of sizzling oil and joyful diners. The little fried rice flour coins are fresh, thin, crisp, tasty, soft, not too oily (though still pretty oily), and nice and creamy in the centre (thanks to plenty of coconut milk, I imagine). Head to Cô Xuân if you’re a street-food foodie – you won’t be disappointed, because this is about more than the food: it’s the full dining experience. Bánh Khọt 14 is a relative newcomer, and it’s noticeably ‘higher end’ than other places in this list. All seating is inside, on ‘normal’ height tables and chairs (not stools), the walls are made of brick and have been plastered and painted, there’s a real roof on the building, and there’s no sign of corrugated iron anywhere (the preferred building material of many of the places in this list). All this unnecessary attention to decor might put some people off, but, what Bánh Khọt 14 lacks in street-style ambience, it makes up for in quality and presentation. The bánh khọt here are beautifully presented: so pretty it seems a shame to disturb them. The serving is big and generous, the leaves and herbs are enormous, and the family running the place are warm and welcoming. There’s a big price to reflect all this: 50,000vnd per plate. 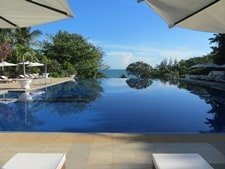 But when you think about it, some of the other so-called ‘famous’, long-running places in the list have the same price-tag, so what’s the difference. 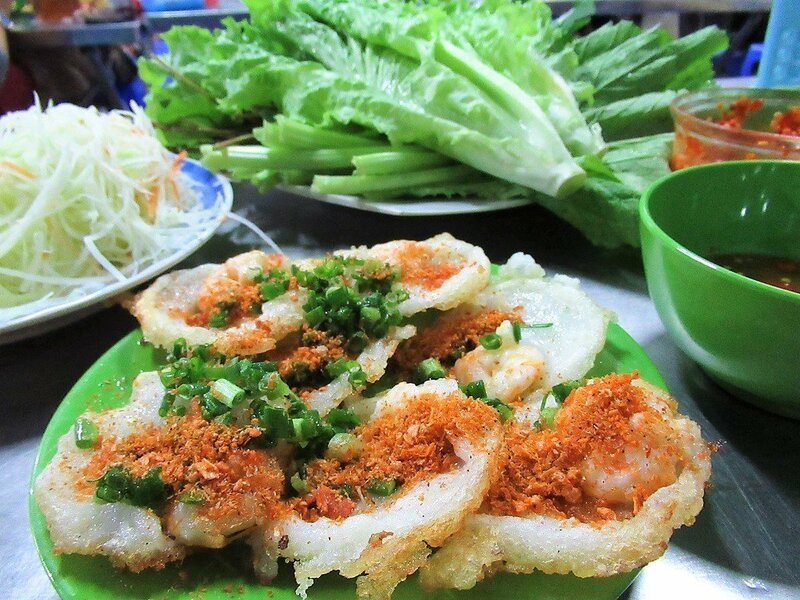 Also on offer here is bánh khọt mực sữa (baby squid), an interesting alternative to the traditional shrimp. On a pleasant leafy street (there are many of them in Vũng Tàu these days), Bánh Khọt Cây Đa is named after the banyan tree that’s growing right in the middle of this eatery: its twisted roots spiral up from the concrete floor and shoot through a hole in the corrugated iron roof. This feature, and the heaps of fresh green coconuts piled around the altar next to the trunk, make it a particularly atmospheric place. 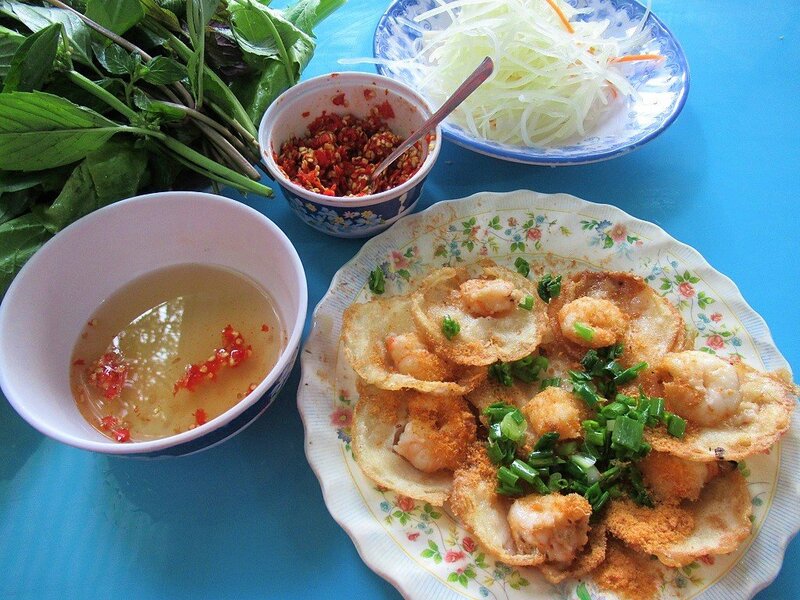 The bánh khọt are crispy and thin – more dainty and petite than other places in this list. They’re loaded with coconut milk and hence creamy on the inside and very flavourful. The herbs are not quite as fresh, clean and crisp as I’d like, but the cool and crunchy shredded green papaya makes up for this. It’s cheap too: 25,000vnd per dish. Another cheapie, and a favourite among many Vietnamese foodies, Bánh Khọt Miền Đông is tucked away on a small back-street. An informal, friendly place serving local families, Vietnamese visitors from the bright lights of Saigon, and a smattering of Vũng Tàu expats, the bánh khọt here are small, crunchy and tasty, and the atmosphere pleasant. At 25,000vnd per dish, this is one of the cheapest in the list, and it’s much better value for money than other ‘famous’ bánh khọt joints that have doubled their prices because of their fame-tag. Part of the fun of eating at Bánh Khọt Cây Sung Cô Hai is watching the cooking take place. The kitchen, where the little pancakes are fried in individual trays, is open to the street, allowing visitors to gaze at the process. The food itself is pretty tasty (but also pretty oily), and the older couple running the place are welcoming to diners. 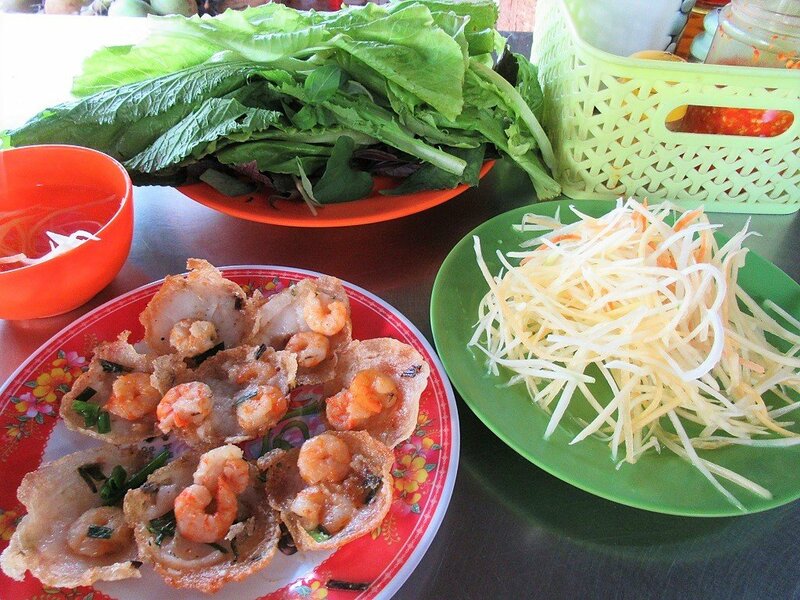 The herbs are especially good, and the shrimp are big and juicy. However, this is yet another ‘famous’ place whose fame has gone to its head, and the price no longer represents value for money: 50,000vnd per dish. Unpretentious, cheap, very friendly and very good, Bánh Khọt 368 is not one of Vũng Tàu’s famous ones. But, to me, that’s a big part of its appeal. 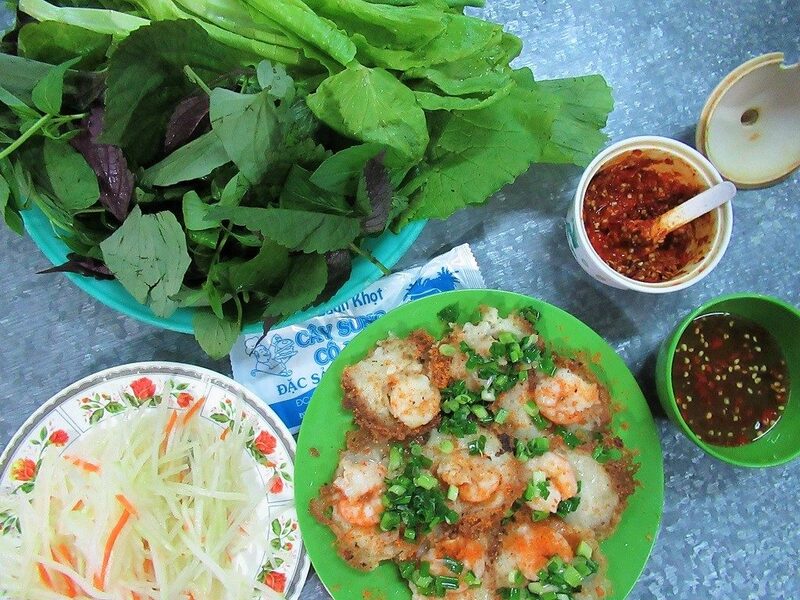 Located on the corner of a bustling intersection, opposite a park, this place is a palm-thatched, opened-sided shack, where a lovely family serve up good bánh khọt. Cooked out front on the sidewalk, over a coal-fired stove, the texture of the discs is just right, and they come with a basket of big, healthy-looking leaves (although there’s no perilla leaf). If you’re still hungry after, they share the space with another vendor who does fabulous grilled rotisserie chicken and pork. 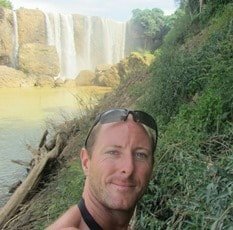 This entry was posted in ALL, FOOD & DRINK, Resources, Street Food and tagged banh khot, foodie, guide, street food, Vietnam, Vung Tau, where to eat. Bookmark the permalink. Sooo missing my hometown, Vung Tau. 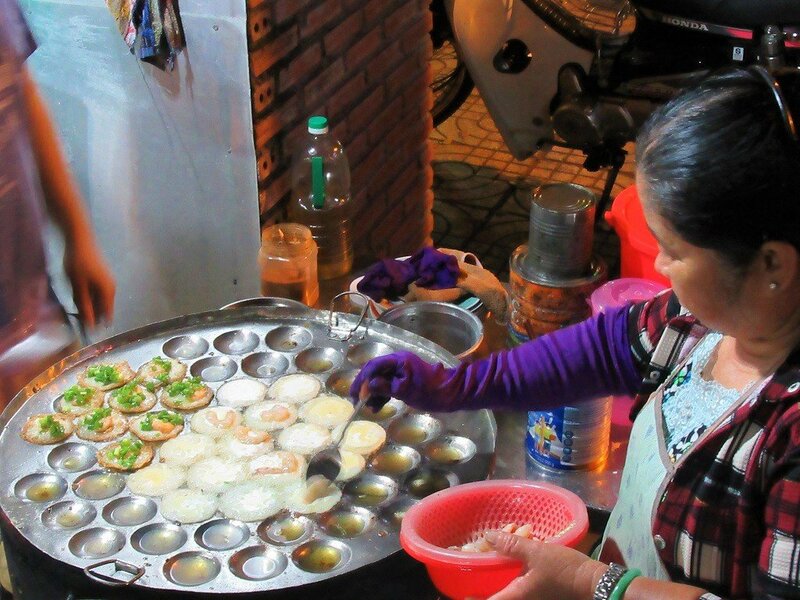 Banh Khot is Vung Tau Specialty. Thank you, Tom. Thanks. Yes, it’s a great dish. 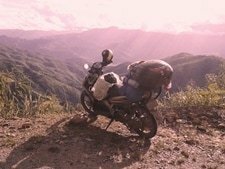 Have you crossed Gành Rái Bay from Vũng Tàu to Cần Giờ yet? . Yes, I think there are two boats a day in both directions – but they are both in the morning: something like 7.30am and 10am, I think. Motorbikes can go on the boat too.